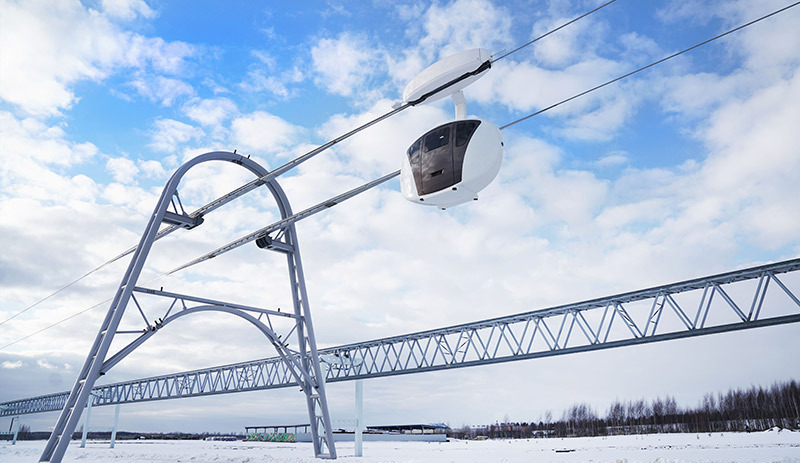 The development of new types of rolling stock and SkyWay transport complexes continues. Our today's story is about uniwind  a suspended automated passenger vehicle of SkyWay string-rail transport system, or U4-651. simplicity and low cost of the track structure. Mikhail Kirichenko: Hallo! Here is Mikhail Kirichenko with you. You are watching SkyWay news, where we report on the developments and implementation of breakthrough transport technologies. In any weather, at any temperature, at any wind. We are now at SkyWay EcoTechnoPark at the "second" level, as you might have guessed, talking to a man who is in charge of developing this vehicle Victor Garakh, Head of the Layout Design Bureau at the SkyWay Technologies Co. Hallo, Viktor! M.K. : Here is an interesting vehicle that all the guest of EcoFest could see last August. I hope now we'll see it in operation. First of all, please tell us what was the need for its designing and development? What is its difference from the seemingly similar unibike? V.G. : The need for its development was caused by the fact that when rendering a transportation service, we have to grasp and consider completely all demands and wishes of various customers. This vehicle has the lowest cost due to the track structure it moves on. Primarily, it is a low cost of infrastructure construction. We have remote and sparsely populated regions, where construction of a conventional transport system would be very costly. The same refers to the transport of high capacity. However, delivery of goods to the regions, where there are no roads for half a year at all, is also crucial. Therefore, one of our tasks was the creation of a low-cost vehicle with a low-cost infrastructure. M.K. : As I understood you, the basic difference of uniwind from unibike is that it runs on a different track structure, which is even more cost-efficient than that one for unibike. V.G. : That's right. From the point of view of the consumer it is so, but from the point of view of the design this vehicle is additionally modular so as to get a pod of various use on the basis of the components of this single vehicle. In this case uniwind is modular, it consists of three basic components: traction unit, connecting gear and suspender. It may be a passenger or cargo module. Based on these modules, we can make vehicles of various configuration  both load-carrying and of high-passenger capacity. M.K. : How much time did it take you for designing? When did you get the tasking order and how complicated is this pod? V.G. : Here you see a fully-fledged pilot sample that has its own lifecycle. In accordance with the standards ISO-2001-1015, we do the whole NPD cycle, i.e. from compiling the technical specification to conducting certification tests. Initially, we received a tasking order to develop such a system in late February last year. We have prepared design documentation by last May and the sample was produced in July. As you mentioned everyone could see it at EcoFest. We began start-up work in September. It was the adjustment of the vehicle and the complex as a whole, because we are working out not just some parts, but the whole complex capable to render certain services. As regards the technology, this vehicle is quite different. It is built by modular principle and has its independent units that can be used to compose any type of pods by the purpose of use. Both a higher-capacity passenger vehicle and a cargo vehicle as a cargo module or some suspenders to haul some goods. It is important not only for remote regions in the Extreme North, but in Belarus, too. When there is no bridge across a river, we can easily arrange our low-cost infrastructure and use it without a pod, just with suspenders for cargo or people. From the technological viewpoint, this pod is much more complicated than unibike. It is quite powerful and equipped with full-scale systems and units, primarily, with the safety system. They have several special devices including technical vision system, intelligent control system, the system controlling all the units and the vehicle as a whole. There is also a chassis system  a towline trolley, suspension, power supply system and many others. To make it clearer (since our transport is innovative), let's take a conventional car for comparison. If the car is equipped with chassis, suspension, motor and control gear for operator, our transport is completely automated. It has the same systems plus the intelligent component. That is, the transport itself is a direct participant of controlling traffic and its entire complex. M.K. : How much time did you need for designing and developing this project? V.G. : It took us about four months for project designing from setting technological task order to preparing the whole design documentation. Taking into account that it contains 4,000 formsheets, it is a very brief period. My colleagues and professionals applied maximum efforts to do this work by deadline. M.K. : Thank you very much. I hope we will see the uniwind in action today. Its name emphasizes the wind we are experiencing now. The last question. When are you planning to start certification, running tests and so on. V.G. : Our whole work is scheduled. Now we have finished the stage of start-up work, passed over to the acceptance of the product together with the complex by various features, therefore, it will take longer time. Next, we have planned full-scale preliminary and acceptance tests. I think we shall reach certification by the end of spring  beginning of summer. M.K. : Sign up to our YouTube channel. Follow the news update at our official website. Support our project. And then even the word "wind" will mean something positive to you.